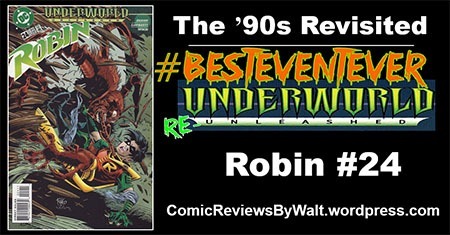 The ’90s Revisited: Robin #24 – Underworld Unleashed! Last month, a number of blogs and podcasts joined together to present #BestEventEver 2018, covering the 1995 event Underworld Unleashed! 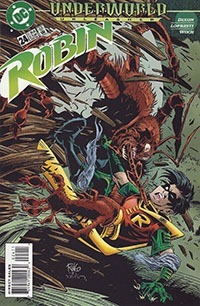 Due to computer issues and developments in my personal life, I’ve stretched my part into November to cover the Robin issues. In addition to my own posts, please check out these other blogs and podcasts for in-depth coverage of the various issues that were part of the event…and join in on further peeks at and discussions of the event on Twitter by joining at hashtags #BestEventEver and #UnderworldReUnleashed! Robin’s been cocooned ALIENS-style (well, lots-of-things-style, but I’m in an ALIENS frame of mind), unable to free himself yet, but in contact with Alfred…who can provide some information if not actual help (such as the fact that a ‘Charaxes’ is a butterfly, not a moth…but Robin’s not sure his captor’s sweating the details. While Tim struggles and eventually manages to use his extending bo to free himself…the police–even armed with a shotgun–don’t fare well against Charaxes. Robin then gets to have a go at the creature, but eventually it looks like he’ll get to experience that which Alfred had told him about…when a mysterious figure shows up, shoots Charaxes, captures him in a high-tech net…as our hero passes out. When he wakes, it’s to Batman (who arrived too late to have helped), and both are left to wonder about the mysterious entity. At school the next day, Tim is approached by a rival who is willing to put aside differences and "recruit" Tim…in vigilante opposition to the influx of new students. When he shows off a gun…he’s got Tim’s attention! This is a fairly solid issue of Robin. We get to see our titular hero escape a "death trap," fight the villain, and even interact with Alfred and Batman. In addition, we get to see a bit of Ariana and her family in their new home, as well as see Tim at school with his friends. While this issue came off a cliffhanger, one isn’t really missing a CRUCIAL piece of story–it’s easy enough to catch up from exposition. This is from a time when comics were not locked into a rigid cycle of X number of issues = 1 graphic novel/collected volume. Each issue was episodic, rather than "just" X of Y serialized chapters of a SINGLE story. It’s perhaps a bit fitting that I get to this issue a couple WEEKS later than I had intended–it’s a "straggler" issue for me on reading, as well as covering as part of the #BestEventEver coverage of Underworld Unleashed. While it’s technically a tie-in, it seems to be a later one, and labeled as such almost as an afterthought. You’d want to read this if you’re reading the series, and if you read the previous issue and cared about how Robin escapes from Charaxes…but this really seems to have absolutely nothing to do with Underworld Unleashed, and would be suitable for getting in conjunction with that solely for the logo on the cover. Visually, I like the issue. It’s just Robin for me. It’s not trying to be some distinctive visual interpretation, it’s just…Robin art for a Robin issue. If I wasn’t looking at the credits I probably wouldn’t identify the artist offhand…but in the way this issue is, that’s a good thing, as it just looks like a ’90s Robin issue, and not a bad one at that. As with most ’90s comics…this is definitely worth a 25-cent purchase, though there’s not really much to this to make it stand out as a sole, single, isolated issue. 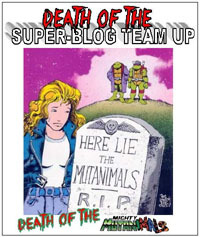 Aside from the "completist" mentality for Underworld Unlimited, if you’re not interested in early Tim Drake Robin stuff, or Killer Moth and that character’s oddities, or the art…I woudln’t suggest hunting this down for the sake of itself. As a Robin issue, and my being a fan of this character…these two issues were a treat to revisit and I’m quite glad to have read them! Again, please check out these other sites for additional, more in-depth coverage of the various other issues–including the main event mini itself–for Underworld Unleashed!